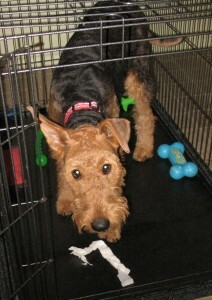 Seeking an Airedale-Experienced Home for Young Jackie! Thank you very much for your interest in Jackie. He has been adopted! 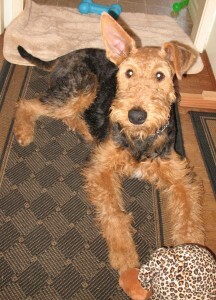 Eight-month-old Jackie is a very large male Airedale pup who urgently needs a new home. Please come play with me! Jackie came into AireCanada’s care during December where he was fostered with a volunteer family while he recovered from a neuter surgery supplied by his former owners. During that time, Jackie demonstrated that he was a very good-natured puppy. 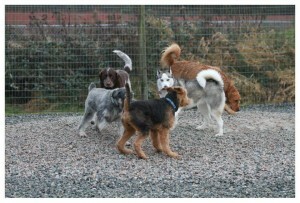 He showed us he loved people, got on well with other dogs, both male and female, learned quickly and was eager to please. 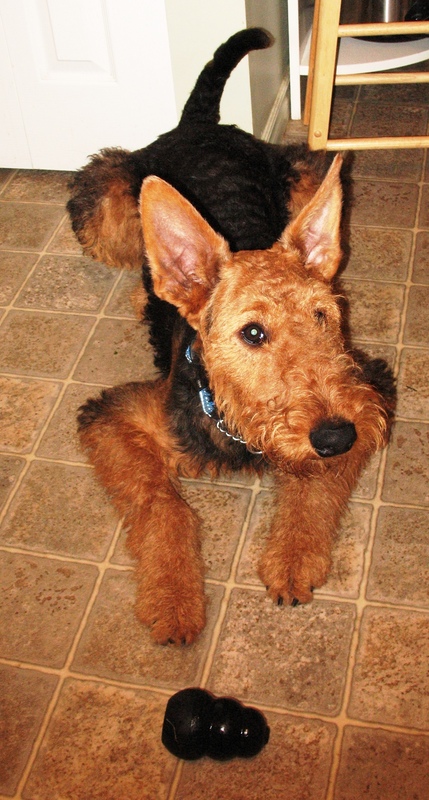 He even managed to win over the foster family’s older male Airedale who was somewhat suspicious of the newcomer with the result that both boys were soon licking peanut butter off foster mom’s hand at the same time. 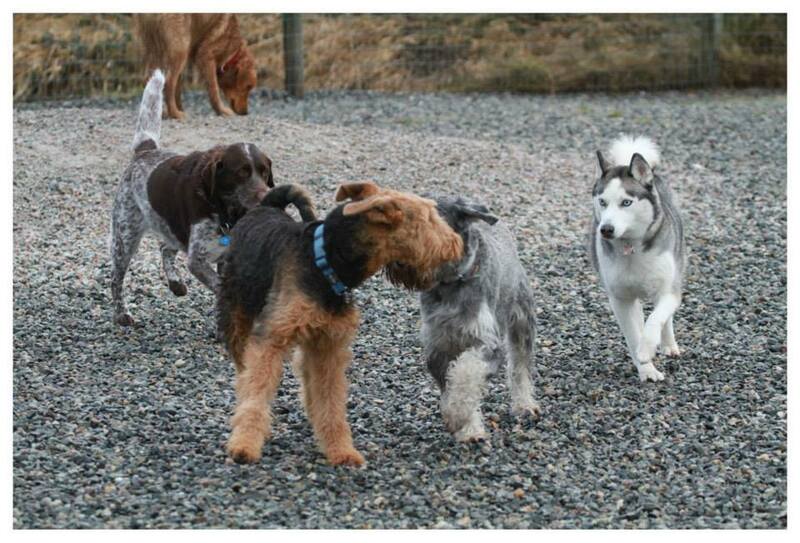 We discovered that Jackie was extremely energetic and very playful. He recalls very nicely. 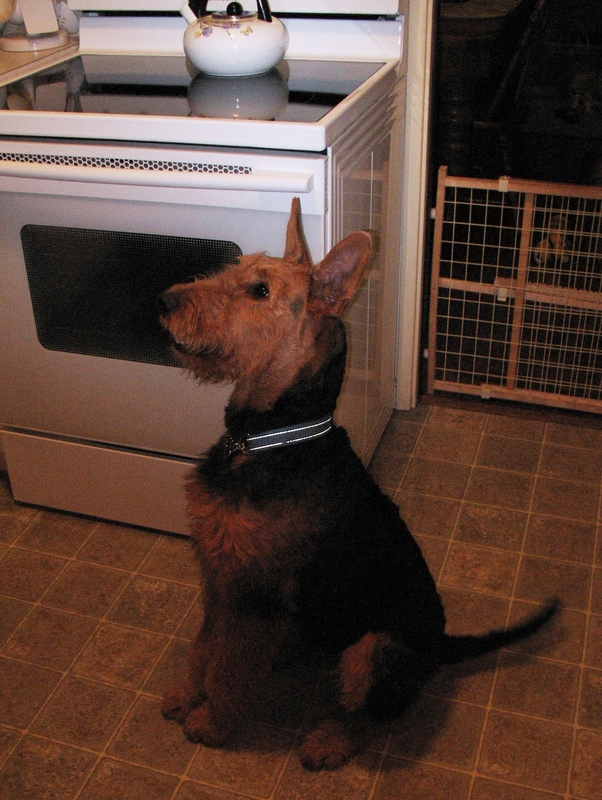 He also was crate-trained and was reasonably content for a time in a very large crate as long as a Kong filled with yummy food and peanut butter was supplied. At night, Jackie made it very clear that he would prefer to sleep in the bedroom with the rest of the foster family and happily snoozed in a VariKennel at the foot of the adults’ bed. 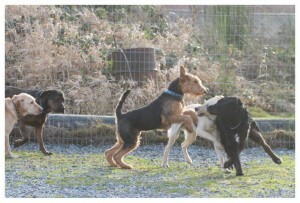 The family Airedales had no difficulty with Jackie joining the bedroom party. I don’t mind a crate sometimes as long as I get lots of exercise first! Jackie proved to be an engaging companion and one we wished we could keep forever. However, once the stitches from his neuter surgery were removed (with our sincere thanks to Dr. Pawel Cichon at Lonsdale/Sunwood Vet hospitals), it became apparent that he needed far more exercise than we were able to provide so we turned to our good friends at Willchris Kennels in Surrey, BC, for help. Jackie was transferred to WillChris’ care where he would be able to run and play with other dogs. He is currently still with the fine people at Willchris and appears to be having a marvelous time. As a result, we have learned that he is eager to play with other dogs, loves to run and is enjoying being a silly big puppy. 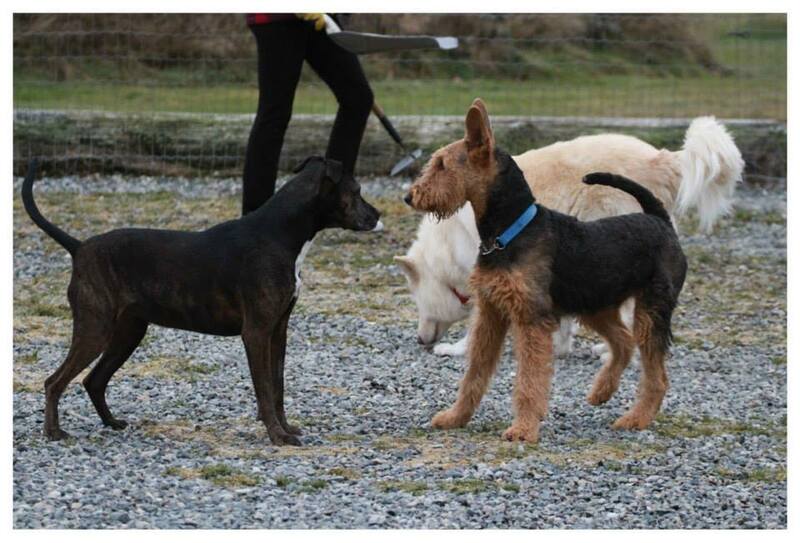 The ideal home for Jackie will have experience with Airedale Terriers and will be able to provide the many opportunities for exercise that a young, energetic dog requires. The ability to offer leadership will be essential. 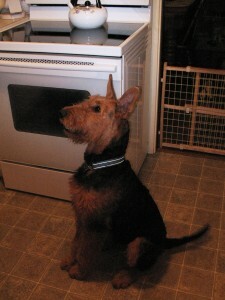 Jackie will require obedience training and reacts well to positive training methods. He learns quickly. Jackie would fare very well with someone who loves the outdoors and wishes for a hiking or running companion. We know that Jackie would prefer a home with a large fenced area where he can play; the presence of another large dog or two for companionship would be an asset. We suspect that cats or small dogs would not be suitable house mates for this large pup since he is too “bouncy” to play with smaller animals. The same could be said of small children. 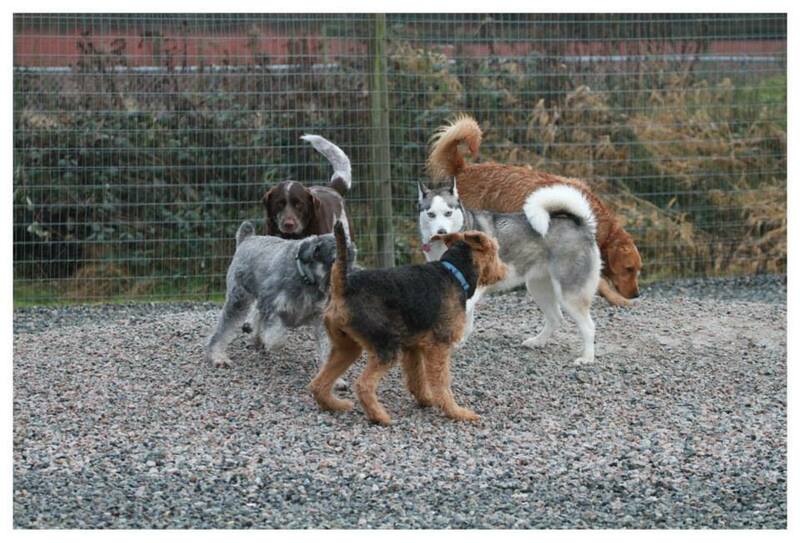 Although Jackie really likes children, our preference would be that any children in the family be teenagers or older. 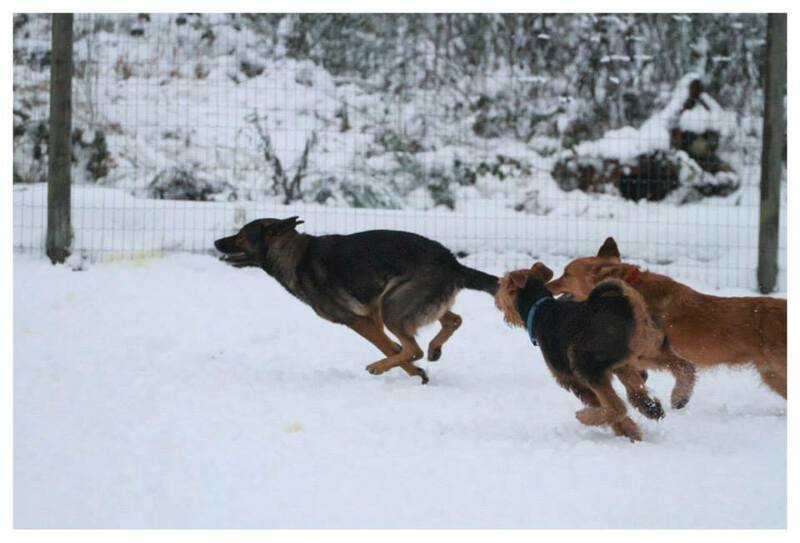 We believe that Jackie would enjoy having a job to do — agility perhaps or competition obedience. We also believe that it is extremely important that Jackie’s new family be around a reasonable amount of the time. 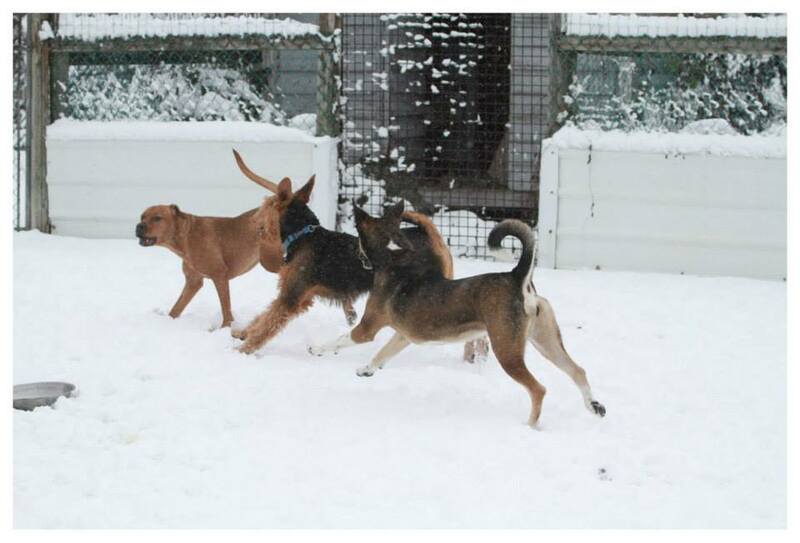 We will not place Jackie in a home where he will be crated or left outside on his own for hours on end. He clearly wants to be someone’s companion and is just as clearly prepared to worship his new owner(s). So, how about it? Is Jackie your dream Airedale? He hopes so! I’d sit and stay and learn to walk on leash, too! Please complete our online application form if you wish to be considered as a candidate to adopt Jackie. Note that priority will be given to applicants located in BC! We are so sorry that you lost your 4 year old Airedale. Please accept out most sincere condolences. The reason we are suggesting that Jackie be placed locally is because of the difficulty in transporting a dog across the continent. It is costly and a very unpleasant experience for the dog. We have had a dog we transported by plane arrive injured one time. 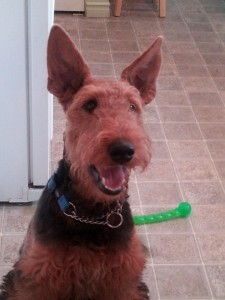 I should imagine that there would be Airedales available through your local Airedale rescue group — New England Airedale Rescue. Good luck! 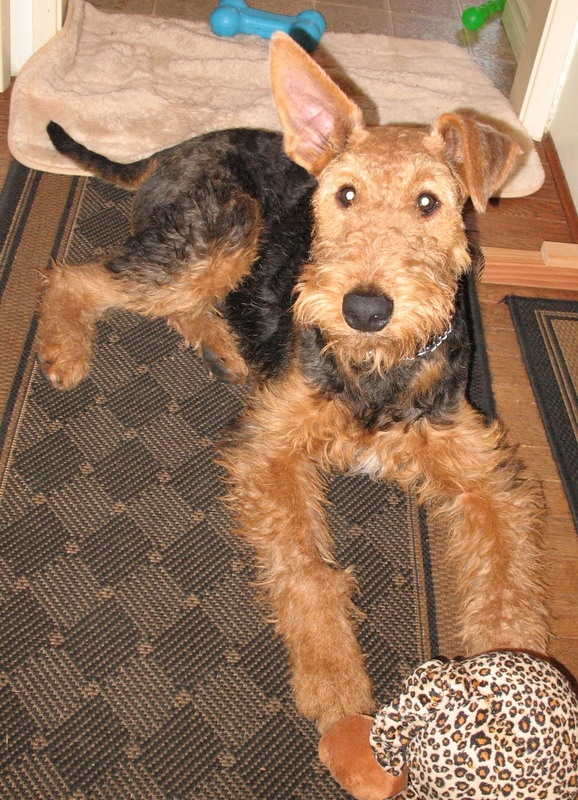 We hope you find an Airedale to keep your present girl company very shortly. Thank you for your interest in Jackie. What an absolute cutie! I LOVE his ears.Now if I wasn’t so bent on getting a female this time I would be there right now.He looks as tho he would be the same size, and same activity level as my late boy, Marvin. Hugs Jackie, and whoever adopts you is very lucky. 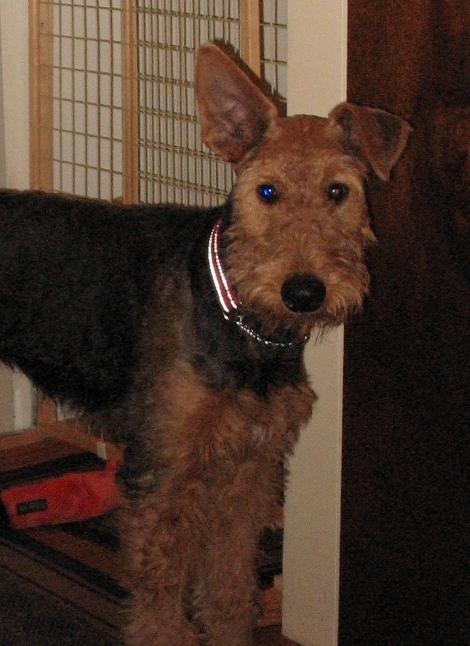 My husband and I already have a six year old Airedale Terrier who is our joy. We live on more than an acre of property and we love exercising our dog. I work from home and we have no children. 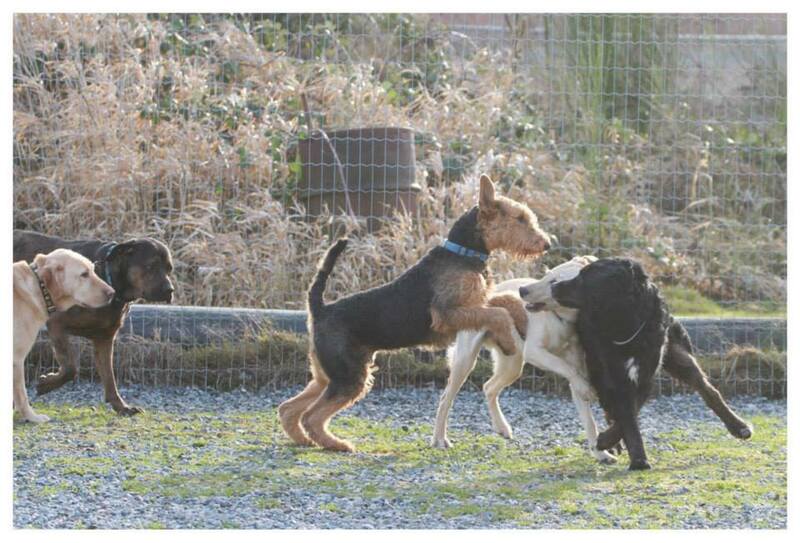 Our airedale (Chewie) is non dominant….a lamb really so having a puppy companion would help keep him active. If you cannot find a suitable home in BC, please contact me…..416 407 4288. Thank you for contacting us. We placed Jackie this morning in a new home!